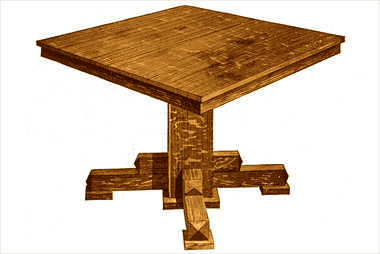 Click here for detailed extendable dining table plans. It should be made of quarter-sawed oak, which can be secured at the mill ready cut to length, squared and sanded. 2 top pieces, 1 by 23 by 46 in. 2 extra leaves, 1 by 12 by 46 in. 2 rails, 3/4 by 3 by 44 in. 4 rails, 3/4 by 3 by 22 in. 2 pieces for posts, 3/4 by 8 by 24 in. 2 pieces for posts, 3/4 by 6 by 24 in. 4 pieces for feet, 3 by 3 by 14 in. 4 pieces for feet, 3 by 3 by 5 in. 4 pieces for feet, 1 by 4 by 4 in. 4 pieces moulding, 1 by 1 by 10 in. 1 piece, 1 by 12 by 27 in., birchwood. 2 brackets, 3/4 by 3 by 32 in., birchwood. 2 pieces for slide, 1-3/4 by 3 by 36 in., birchwood. 4 pieces for slide, 1 by 3 by 36 in., birchwood. 12 pieces for slide, 3/4 by 1-1/2 by 36 in., birchwood. The feet can be made first by squaring up one end of each and beveling the other as shown in the drawing. The short pieces are fastened to the long ones by means of long screws and glue. The four square pieces should be nailed to the outer ends and holes bored in them for the casters. Prepare the pieces for the posts, and before nailing them together fasten the feet to them with long screws. Be careful to get them on square, else the table will not set level when complete. Now nail and glue the pieces forming the table together and fasten the moulding at the bottom. This moulding should have mitered corners as shown in the bottom view. Also fasten the rest piece to the top of the post, using long screws and glue. The slides can be made next. The pieces are made and fastened together with screws as shown in the enlarged detail view. This slide, if made with care, is a good one. The center piece should be firmly fastened to the post rest with long screws. The screws that fasten into the top should be inserted from below through counter-bored holes as shown. Miter the rails at the corners and glue them to the top. Blocks can be used on the inside if desired, which will make a much stronger construction. Screw the two brackets to the top as shown. These help to support the table when it is extended. When complete the table should be carefully gone over with fine sandpaper, and all glue and rough spots removed. 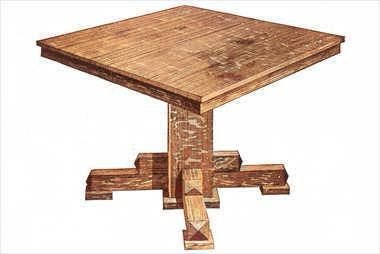 The dining table can be finished in any one of the many mission stains available.